A Canadian equestrian who lost a horse to a tendon injury is part of a team creating a harness for horses to help in the recovery and rehabilitation from limb injuries. Biomedical engineering master’s student Samantha Steinke joined the research project at the University of Saskatchewan in 2016 as an undergraduate student after her horse had to be euthanized following a tendon injury. She is working with RMD Engineering Inc. of Saskatoon to build and test the new harness. Challenges facing researchers include the unique biomechanics of a horse, which carries 60 per cent of its weight on its front legs. When the animal injures a limb, it redistributes its considerable weight — from 400 kilograms to more than 550 kilograms — to its uninjured legs, often leading to supporting limb laminitis, which has a poor prognosis. “If this works, the potential impact will be huge because there are no long-term rehabilitation harnesses available on the market today,” said Dr. Julia Montgomery at USask’s Western College of Veterinary Medicine, who leads the research. Euthanasia is often necessary because laminitis causes the horse to shift weight back to the originally injured leg, preventing healing and worsening the animal’s condition. “Support slings and rescue slings aren’t suitable because they pick up the horse under the chest and abdomen, where they should not be picked up because it affects their breathing and other physiological functions,” said Steinke. Montgomery has worked for the past four years with RMD on testing and fine-tuning the company’s Equine Assisted Rehabilitation Lift, designed to suit the biomechanics of a horse. 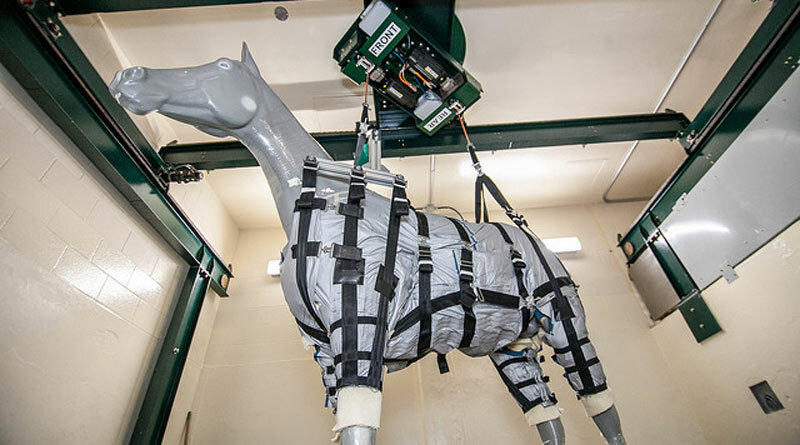 The harness will complement the functions of the lift, which uses a computer-guided weight compensation system to slowly load the limbs of a horse during the rehabilitation, and support them if they stumble. Steinke said her work is focused on the load-bearing structures on a horse, and on building the harness so as to distribute the weight over solid bone structures, not muscle or organs. With quick release buckles, the harness will be easy for one or two people to put on or remove — an important consideration for rural veterinary practices, which often have only a single person working. Samantha Steinke and her horse Cash. In 2016, Cash stepped on a piece of metal, puncturing the sole of his left front hoof and cutting through the tendon. Despite the best efforts of veterinarians, and due to the very poor prognosis and complicated nature of the injury, Steinke was forced to make the agonizing decision to put him down. For Steinke’s master’s project, the team is focusing on testing a breastplate designed and built by RMD that will help redistribute weight on the front of the horse. The device will have electronic sensors that detect pressure, heat and moisture levels, and proprietary means for adjusting its load to relieve pressure. RMD aims to have the breastplate ready for testing on a thoroughbred horse at the veterinary college by May, with testing continuing through the summer to modify the design as needed. Montgomery said progress is necessarily slow because each step forward depends on the preceding step, and planning several steps ahead isn’t feasible. The hind legs section of the harness will take longer because the design has to enable the horses to urinate and defecate. “I love horses and want to make contribution to equine health. I want to help solve a problem that doesn’t yet have a solution,” said Montgomery. Last year, Steinke was awarded an 18-month master’s fellowship by Mitacs, which is sharing the cost of her $45,000 fellowship equally with RMD. Mitacs is a publicly funded not-for-profit research and training organization that supports collaborations between industry, academia and governments in Canada.